ScienceDaily, Apr. 11, 2008 — “In a world without human-produced pollution, biological productivity controls cloud formation and may be the lever that caused supergreenhouse episodes during the Cetaceous [sic] and Eocene, according to Penn State paleoclimatologists. Kump and David Pollard, senior research associate, Earth and Environmental Systems Institute, looked for another way to create a world where mean annual temperatures in the tropics were above 100 degrees Fahrenheit and polar temperatures were in the 50-degree Fahrenheit range. Changing the Earth’s albedo — the amount of sunlight reflected into space — by changing cloud cover will produce supergreenhouse events, the researchers report April 11 in the journal Science. 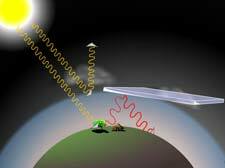 According to the researchers, changes in the production of cloud condensation nuclei, the tiny particles around which water condenses to form rain drops and cloud droplets, decreased Earth’s cloud cover and increase the sun’s warming effect during supergreenhouse events. Some of you may be familiar with a fairly well known creationist book entitled “The Waters Above” (Joseph Dillow 1982) championed at the time by ICR and viewed as a serious possibility by creationists. The model was later shown to be flawed as everything would have been fried on earth. But at least Dillow was on the right track … i.e. he believed that there was literary evidence for a ‘supergreenhouse’ period on planet earth at some point in the past. Apparently he was right although he was wrong about the exact mechanism and he would differ with these authors on how long ago this period occurred. This entry was posted on Thursday, April 17th, 2008 at 4:25 am and is filed under Genesis Flood. You can follow any responses to this entry through the RSS 2.0 feed. You can leave a response, or trackback from your own site. I wish I could see something more than hopeful speculation in the absence of any confirming evidence whatsoever that there is anything but wishful thinking in this contrived connection between the quoted Science article and Genesis. But I can’t. To use your first chosen quote from Genesis to support the idea that there was ‘a significant difference in the world hydrological cycle prior to the Flood’ seems to be driven by the conclusion that you wish to make. I would make the same point about your second and third biblical references. I have commented previously on your remarks about geomythology and the tropical poles and see little purpose in repeating them here. The simple fact is that there is absolutely no evidential support in the science and research you reference here for the mythical and legendary ‘history’ in Genesis. I’ll grant you that the third Genesis passage is a bit tenuous. But why do feel that way about the 1st and 2nd? They seem fairly clear to me. Granting, for the sake of this argument, Genesis as an accurate account rather than a moral allegory, there seems to be little in the first two chapters that allows anything other than a very speculative guess as to what the climate either pre- of post-Flood may actually have been. The words used are undefined and very much subject to personal interpretation. The terms ‘mist’ and ‘divided the waters’ seem somewhat tenuous evidence on which to draw conclusions on a global climate. This is prompted by curiosity: I see your article on Lake Suigestu has its comments closed. Why is this particularly? In other words, since one is a myth, the other has to be a myth also. It doesn’t follow logically. The commom elements should hint to something in it. Legends and myths don’t grow in mind air. MOstly, they are made up to explain real events, or real historical figures. The belief that Garden of Eden is a myth is reflective of the philosophy of the speaker rather than from the empirical evidence.